At Haney Orthodontics, we firmly believe that everyone deserves to have a beautiful, straight smile. We are proud to offer a wide variety of teeth-straightening appliances to our patients, including discreet Invisalign® aligners. Our San Anselmo and San Rafael Invsalign® services can straighten your teeth without drawing unnecessary attention to your mouth. Unlike traditional braces, Invisalign® does not utilize brackets or wires to straighten teeth. 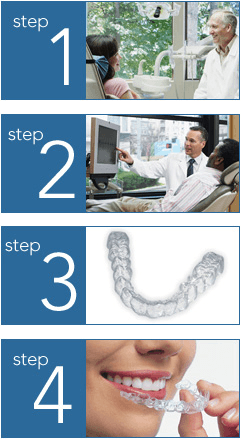 Instead, the aligners are clear, smooth, and virtually invisible. Clear aligners may not be ideal for all situations, but they are commonly used to correct underbites, overbites, crowding, excessive spacing between teeth, and crossbites. Treatment time varies, but averages between 6-15 months. Patients can expect to receive a new set of aligners once approximately every two weeks until their treatments are complete. Although the aligners are removable and can be taken out to eat, brush, and floss, it is important to avoid removing them too frequently. For best results, be sure to wear them per your doctor’s instructions. Invisalign® Teen appliances are designed to color-change slightly as an indicator of how long each aligner has been worn and when it needs to be replaced. Individuals in the San Rafael and San Anselmo area who want to find out if they are good candidates for Invisalign® are encouraged to schedule an appointment with Dr. Haney. Appointments and consultations may be scheduled by contacting our practice at 415-453-7880. We look forward to hearing from you soon and welcoming you to the Haney Orthodontics family.